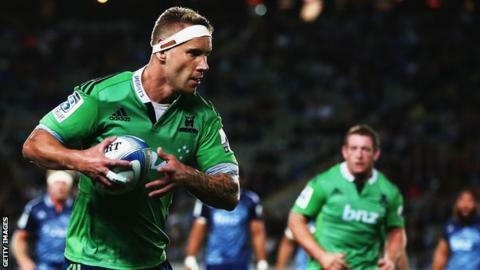 Cardiff Blues have signed New Zealand lock Jarrad Hoeata from Super Rugby side Highlanders. The 31-year-old has been capped three times by the All Blacks and made 54 Super Rugby appearances. Blues chief executive Richard Holland confirmed the move on Twitter in the wake of their 29-22 Pro12 win over Edinburgh. Hoeata can also play in the back-row and has signed a three-season deal to keep him in Cardiff until 2017. With experience at provincial level for Taranaki in New Zealand, Hoeata joins Blues as they prepare for life without Wales lock Bradley Davies. Aviva Premiership club Wasps announced in February that Davies will join them at the end of the current campaign. Hoeata made his Test debut in 2011 against Fiji and went on to play twice against South Africa. In a Blues website statement he said: "I wanted to leave NZ while I am still on top of my game so I could really contribute wherever I went. "I am now massively excited about joining Cardiff Blues and helping them reach some lofty goals moving forward. "I have only heard positive things about the Blues set-up and Cardiff itself. "I am good mates with Paul Tito who thoroughly enjoyed his time there so I am really looking forward to the move north once I'm finished with the Highlanders. "I'm excited about the challenge of playing rugby in Europe. "I know it will be different to how we play the game here but I am really motivated by that challenge."